Aims: To estimate the prevalence of metabolic syndrome in a general population sample of south Asians and white Europeans and compare predictors of metabolic syndrome, using ethnic specific definitions of obesity. Methods: 3099 participants (71.4% white European, 28.6% south Asian) aged 40-75 years were screened using a 75 g oral glucose tolerance test. Metabolic syndrome was defined using National Cholesterol Education Programme and International Diabetes Federation definitions. We compared sensitivity, specificity and area under the curve of waist circumference, body mass index and waist-hip ratio. Results: The prevalence of metabolic syndrome using the definitions above was 29.9% (29.2% south Asian, 30.2% white European), and 34.4% (34.2% south Asian, 34.5% white European), respectively. Using the National Cholesterol Education Programme definition, waist circumference was significantly more predictive of metabolic syndrome than body mass index or waist-hip ratio. The area under the curve for waist circumference was 0.75 (95% CI: 0.69-0.80) and 0.76 (0.72-0.81) for south Asian men and women; 0.83 (0.80-0.85) and 0.80 (0.77-0.82) for white European men and women. Conclusions: The prevalence of metabolic syndrome is high in both south Asian and white European populations. Waist circumference is a simple and effective measure for predicting metabolic syndrome in different populations. 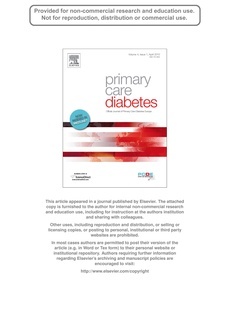 © 2010 Primary Care Diabetes Europe.